When blue cheese dressing is good, it's lick-the-plate-dunk-the-wings good. When the flavor or texture is off, it can really drag a dish down. The challenge is that most of us don't make scratch blue cheese dressing regularly so it can be tough to dial in a recipe. Hopefully my experimenting will take the guesswork out of things for you. Homemade blue cheese dressing recipes often suggest using a food processor to blend the ingredients. I tried this method a few times and found that the texture wasn't ever thick enough. The dressing didn't cling - it dribbled. I puréed various percentages of the dressing but couldn't hit upon the right consistency. The other issue was that the dressing was too salty on the first try. Quality Roquefort is delicious but can really crank up the sodium content. After some trial and error, I finally ended up with a Goldilocks recipe and the method was even easier than expected - one of the easiest recipes I've posted to date. Similar to Scratch Mayonnaise and Homemade Applesauce, I haven't tasted anything better out of a bottle and you can pronounce all of the ingredients. "Personal, national, or geographical names, and words derived from such names, are often lowercased when used with a nonliteral meaning." So, "Brussels sprouts" may have picked up their name in Belgium, but the sprouts I buy from the farmers market are from Cali. The Chicago Manual of Style would not capitalize "Brussels" in my case. That's quite sensible, but let's confuse things. Merriam-Webster offers both "brussels sprout" and "Brussels sprout" as appropriate spellings while the Oxford Dictionary only suggests the capitalized version. The New York Times style guide suggests that "brussels sprouts" and "baked alaska" be lowercase but "French fries" is capitalized. OK then. In most of my online travels, there doesn't seem to be a right or wrong way to do things. I think The Chicago Manual of Style's suggestion that nonliteral names be lowercase is pretty logical, but The New York Times and their preferential treatment for France and snub to Alaska is confusing. My approach at this point is to just capitalize regions and proper names as best I can. And because my blog's spellcheck will not be ignored, it added two cents and suggested "brussels" and "alaska" should be uppercase. Lack of clarity, brought to you by the Interwebs. The saltiness of different kinds of blue cheese varies greatly. In my experiments, one batch of dressing was too salty, the next was just right, and the last needed a 2-finger pinch of salt to round out the flavor. Taste your cheese and adjust accordingly. Kefir is a little bit thicker so I prefer it, but buttermilk will absolutely work. An extended discussion about kefir is in my Apple-Walnut Tea Cake post. As The Food Lab states, don't skimp on the cheese. 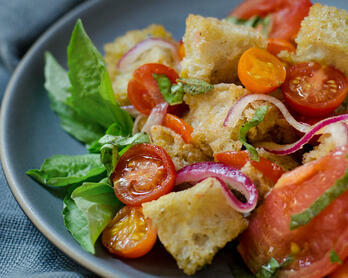 The quality of your ingredients is key for this dish. In terms of mayonnaise, it takes 5-10 minutes to make and is absolutely worth it. The secret to great bacon is patience. I've tried all methods from microwaving to baking but it's the stovetop that produces a consistently excellent product. By using medium-low to medium heat, the bacon slowly cooks and caramelizes in its fat creating an even texture throughout as well as an intense sweet and savory flavor. I guess you could say this method is bacon confit adjacent. It takes a bit longer than 3 minutes in the nuker but the payoff is significant. I realized after writing this post that I forgot to put Pickled Red Onions on the salad before taking a picture. Oops. I highly recommend either pickled or raw red onions and have included them in the instructions below. In terms of raw onions, the short ice bath tames the flavor a bit. 2-3 slices of Nueske's bacon Note: Nueske's bacon is smoked, has a slightly thicker cut, and I pick it up from our local butcher. A quality applewood smoked bacon would be a fine substitute. Stir together kefir (or buttermilk), Homemade Mayonnaise (or preferred brand), lemon juice, vinegar, and a few cranks of black pepper. Add the cheese and mash with a fork until you like the texture. 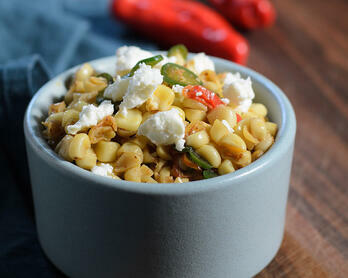 Refrigerate for several hours or overnight so that the flavors can marry up. 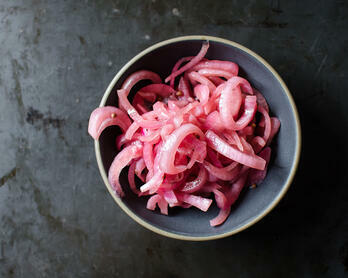 For pickled red onions, follow this recipe here. For raw red onion, thinly slice the onion and place the slices in a bowl of ice water for about 15 minutes. Remove, pat dry, and set aside. Add the bacon to a large non-stick pan and place over medium heat. Note: The bacon should not be frying aggressively, it's more of a gentle bubbling. This is what helps the texture stay even throughout. When one side is cooked to your liking, flip and continue cooking. Takes about 20-30 minutes depending on the thickness of your slices. Transfer bacon to a plate lined with paper towels to soak up excess grease, chop into bite-size pieces, then set aside. Cut the little gem lettuce heads in half lengthwise and gently rinse the outside and between the layers. Dry and set aside. Preheat outdoor grill or grill pan on the stovetop. Note: I've used both methods and had good results though the outdoor grill is preferable from a flavor perspective. Brush the cut side of the little gems with olive oil. Grill cut-side down until char marks appear, brush the tops with olive oil, then turn and grill for another 1-2 minutes. Note: You don't want to grill the lettuce for so long that they lose all of their crispness. Also, beware of carry-over cooking. 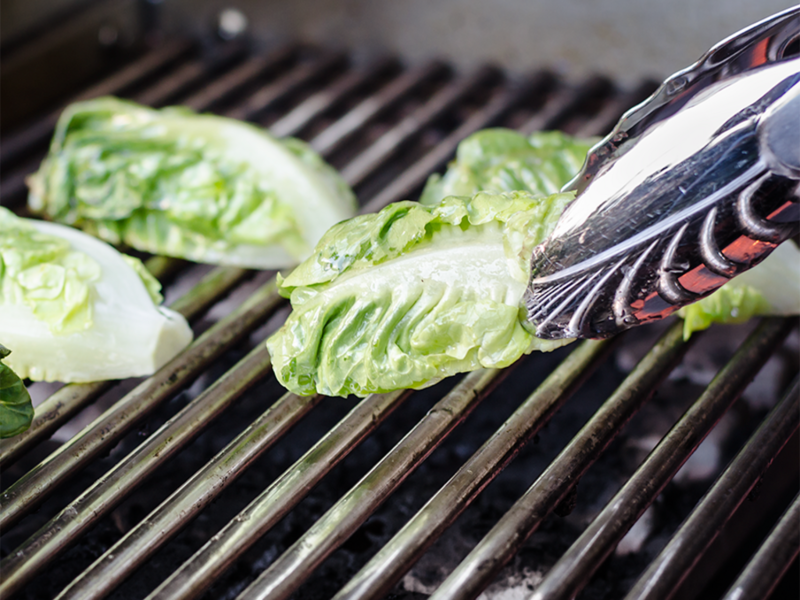 The residual heat will continue to wilt the lettuce long after it's off the grill. Dress the grilled greens with blue cheese, bacon, pickled or raw red onions, sliced cherry tomatoes, and freshly ground pepper.